Last night I worked an event that had about 1,000 guests in attendance. It was a tasting-style event … the kind that have 50 or 60 restaurant chefs in attendance, each handing out samples of their food and cocktails. As they always do, the nonprofit did an excellent job of recruiting, organizing, and training its volunteers. All the volunteers were taken on a tour of the hotel so they knew where to direct guests. They could point out the registration and checkout tables, restrooms, silent auction tables, etc. A designated “volunteer room” was a secure place for people to leave purses, grab a snack, and visit. Each volunteer had specific training for his role. Those helping chef’s replenish supplies were shown where the stock of plates and utensils were kept. Silent auction table monitors were given language to engage guests. Those working the mission table had details on the nonprofit. I like this cheat sheet. It’s small enough to be tucked into a name badge holder and short enough to get the most important information across to each seller. Notice how some details are in boldface. 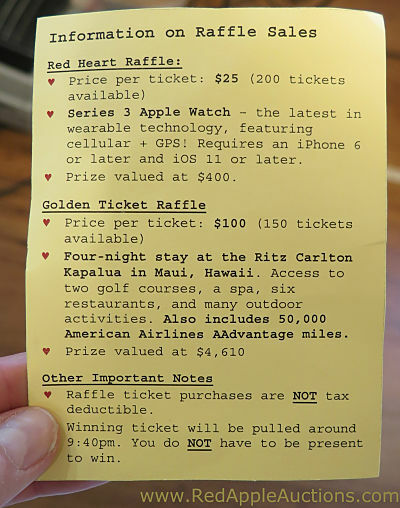 Simple tools like this raffle cheat sheet can keep volunteers focused on the task at hand — selling raffle tickets. It improves sales because sellers have all the information at their disposal as they approach guests. One tip: If there are any restrictions to the raffle prizes, include those restrictions on the raffle cheat sheet. For instance, last night we had some guests ask about any specific black-out dates for the Hawaii trip.